You can see all other interviews (and there are a lot of great ones) in this post. Watch at the source or on YouTube above. Rob: When I read the sript, as soon as you read the script, it's like: wow, it's so different from anything I did before. It's the kind of challenge I look for as an actor. I mean no one else but me got that role. And then I read the script, I really liked the style of it. It was well structured and really easy to read as well. If Robert Pattinson made young girls fall in love with him, he only has eyes for her, Kristen Stewart, who became just as famous with the Twilight saga. For the both of them, it's not as easy anymore to live a normal life. Rob: There's no point in worrying about it. And also, when you come to Cannes, you have to expect all this activity around you. People can think whatever they want. Robert Pattinson is bankable and it helps the auteur cinema. David: Funds for the movie were really hard to find. Actually, Robert helped us a lot because of Twilight and that we can't deny. So bless them! Bless the Twilight movies without which I couldn't have made this movie. Rob: You end up running out of ideas. I've done 5 movies withe same character. Especially someone who doesn't change, I mean, he doesn't die, who has no fears. You get to the point where you're like ... I don't know, people are gonna start calling me out on it. David: I'm hoping that Rob will be in the 5 sequels of Cosmopolis that I have planned. I didn't want to kill you in case we might want a sequel. Interview with Le Figaro. Translation via - You can see the scans here. Le Figaro: How does it feel to be at Cannes? Rob: It's crazy. I was at the screening of On the Road the evening before yesterday. It was intense. At every scene, I felt terrified, blown away, captivated. On the Road and Cosmopolis are kind of similar in a way, they talk about a journey. They're road movies. In a way, they talk about the same thing, freedom, this desperate attempt to look from something different than the sad daily reality. LF: You and Kristen Stewart, both actors from the Twilight Saga, are in competition at Cannes. Is that a game, a coincidence or a challenge? Rob: I don't think of it as a challenge. I admit that it's really strange. The year when Twilight ends, Kristen and I end up in Cannes ... For me, Cannes is the most important competition in the world. When I was a kid, even before I knew I wanted to be an actor, I would rent DVDs with the Palme logo on it to impress my friends. As an actor, you dream that one day all your movies could have that logo on their DVD cases. My secret goal was to one day be invited at the Festival. I thought it could happen in 10 years and it happens now! I think the phone call I got to tell me that Cosmopolis was selected for the official competition, was one of the happiest moments of my life. LF: What push you to make this movie? Rob: He's a guy who did everything to empty himself. A lot of people think he's nihilist. On the contrary, I think he hangs on to the slightest bit of hope. But every time, he's disappointed. LF: How did the filming go? Rob: David Cronenberg did everthing he could to unsettle me. Eric Packer slipped through my fingers like an eel. David constantly told me: 'If you understand anything to what we're doing, it's over!' So I played my role like a melody to a song. I didn't understand the lyrics but I felt like I was in tuned to it. After one week of acclimation, we often filmed scenes in one take. Even the 15 minute scene with Paul Giamatti was done in one take! At the end, this is the movie that gave me the most confidence. LF: Will Cannes be a launching ramp for you after Twilight? 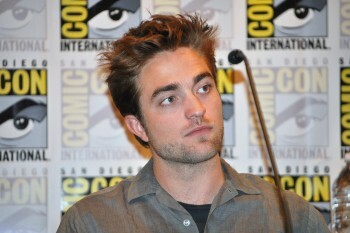 Rob: People don't watch Twilight for what the movies are but more as a global phenomenon. Edward Cullen is like a superhero A superhero who doesn't do anything but be super. In Cosmopolis, I'll finally be judged for my performance. That's why I'm scared! "I woke up this morning and saw all these things about me being cast in The Hunger Games," Pattinson tells USA TODAY. "I was kind of curious for a second. So I called my agent." "My agent was like, 'No,' " Pattinson reports. "(My agent) was like no one's going to offer you that part," Pattinson says, breaking into a laugh. "I was like, thanks for the reassurance." You can read the rest, where he talks about David Cronenberg preparing him for critics before the Cosmopolis premiere at USA Today. I: Robert pattinson, in this movie you are a vampire of finance. Can we analyze this role in this key? R: I mean, kind of. I actually never considered it to be a movie about banks or Wall street. I don’t think Eric sees himself as a person working in the finance world. I think he believes he made money thanks to finance but what he actually likes are numbers; so i don’t think the movie is necessarily about the conclusion of capitalism, not at all. I don’t even know what it is about. I: There’s a theme in the movie: youth, your youth, which finds itself in front of a world much older than him. R: What people find interesting about the movie is the financial crisis aspect, new generations are those who will have to fix everything, those who have a certain age now but aren’t too young won’t have many difficulties. I think it’s important to make this a story new generations can identify with, but we didn’t think it was so important while we were filming it. I:Your character lives in his own world, a world he built for himself. This is the most important characteristic of the role, that he’s apart from others, isn’t it? R: Yes, as you said my character built his own world, and every time we see external shoots we see them through car windows or his own eyes; he doesn’t even speak a normal language- conventional english: he developed his own language. He lives is a very particular world. I: Why does your character go through New York to get a haircut? R: I think he lost his mind, he needs to reconcile with it. And you know when you wake up in the morning and have this idea stuck in your mind- one thing you have to do that day? Maybe that’s it. I: How whas your relationship with David Cronenberg? Were you surprised that he chose you for this kind of movie? R: Yes, i was really surprised, it was an unexpected call and i was really excited to know that I would’ve worked with Cronenberg. This is the type of movie I’m interested in making from now on; it was a really positive experience. I: Is it weird for you to be here in Cannes with Kristen Stewart, who is in another movie? R: Even my friend is here and it’s really weird; this is the year when Twilight ends and both me and Kristen and my best friend Tom are here in Cannes. I: As a young man, are you worried for your future in such a crazy world, that’s experiencing one of the word’s financial crisis ever? What do you think your future will be like? R: Well of course I’m worried, most of all because many guys didn’t even realize what’s going on, they just kept playing videogames on their couch, so when you see movements to occupy Wall Street it’s very encouraging, it gives you hope that in this world there are still people who want to live, who talk to each other, who want to get along, there are communities who care about the world’s destiny, which happens less and less because it’s a though world to live in, everything’s so difficult, so expensive. I think the next 25 years will be very interesting. I: Most of the scenes of the movie are in a limousine, how was acting in a limousine like? 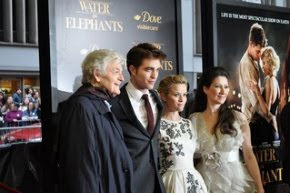 R: I quite liked it; you get used to closed environments and start knowing them well, you learn how to move in them; like, i was in the limo everyday, so i could get in and out very fast, while the other actors had some difficulties At the beginning it was very weird, very claustrophobic, but after a while it was really funny. I: Was it a real limo or a set where a limo was recreated? R: No, it was a real limo even if it was created inside of a studio; you could take off some parts and make it more comfortable but the dimension where those of a real limo, you could even see outside of the windows so it was all very weird. I: Thank you so much.